“This award celebrates all of us and our genuine devotion to senior living. Seeing Holiday colleagues among the finalists three years in a row is a wonderful honor,” said Lilly Donohue, Holiday Retirement CEO. 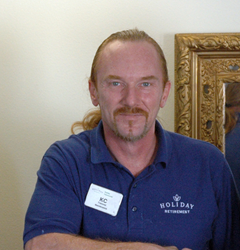 Holiday Retirement today announced that KC Trammel, a maintenance technician at Holiday’s Kamlu Retirement Inn in Vancouver, Wash. was named a finalist in the 2016 Argentum Hero Awards. Argentum is the national association for operators of senior living communities. This award highlights outstanding service to residents within senior living communities across the United States, and recognizes only 15 individuals out of the hundreds of thousands of people serving residents of senior living communities. Five will be elected by the public in online voting to win the Hero Awards. 2016 marks the third consecutive year a Holiday Retirement associate has achieved finalist status in the Hero Award competition. In 2014 and 2015, Holiday associates went on to win the award. As a maintenance technician, Trammel directly serves the small project needs of residents, and performs community-wide maintenance. In his role, he listens to residents’ concerns about safety and comfort—and offers creative ways to help them. Kamlu Retirement Inn’s community manager, Shannon Taylor, nominated Trammel for his outstanding sense of compassion and dedication to quality of life for residents. Taylor said Kamlu residents regularly approach her to share stories about the great work Trammel completed. To vote for Trammel, visit Facebook: http://wshe.es/hJzaEUxT. Voting closes on March 4, 2016 at noon EST. The Hero Awards recognize representatives serving in senior living communities who champion quality of life for the residents they serve and embrace the resident-centered philosophy of senior living. This year, 15 finalists were selected from hundreds of nominations. Of the 15 finalists, five winners will be selected based on popular vote from residents, families, employees, and the general public casting votes on Facebook (http://wshe.es/hJzaEUxT). Based in Lake Oswego, Ore., Holiday Retirement invented the concept of independent senior living in 1971 and is one of the largest providers in North America today, with more than 300 retirement communities throughout the United States. Holiday Retirement provides security, comfort and value to seniors seeking an active and fulfilling lifestyle. For more information about Holiday Retirement, please visit http://www.holidaytouch.com.